When Stephen Colbert appeared to have been brushed off by the notoriously camera-shy Daft Punk, he started dancing to Get Lucky in front of his audience ... and then a whole performance opened up. For some time, he had been enlisting the help of visiting or nearby celebrities, from Bryan Cranston (in rollerskates!) to Jeff Bridges to ... Henry Kissinger. It's one of the best chuckles of 2013. I just watched last night's episode of the Colbert Report; the above - a quick parody of Maurice Sendak's classic Where The Wild Things Are - was a joke that lasted just a few seconds. I love that about Colbert's show: even what should be a throwaway joke has as much effort put into it as an elaborately produced segment. A second list has been a long time coming. I finished it, in part, because the subject - words that are over-used, useless and/or unwelcome - is the subject of Radio Noon's Crosstalk on Monday. (I'm guest-hosting for the week.) Hopefully you'll be able to take part. Our guest is George Murray, who edits the always terrific Bookninja. Outside the box: Somehow, I forgot this phrase last time. I won't repeat the mistake. "Outside the box" is, unfortunately, entrenched in the language. I commonly see it advertised in job notices, mentioned in news releases and said in all seriousness by people who should know better. I recall speaking with a senior editorial manager at CBC who insisted that all his hires "think outside the box." My argument, which probably didn't go over well, was that, by making it universal, he had basically just redefined the box. Impactful: Just because it shows up in an online dictionary doesn't mean it should. I actually prefer this definion, from Urban Dictionary: "A non-existent word coined by corporate advertising, marketing and business drones to make their work sound far more useful, exciting and beneficial to humanity than it really is." There are so many more descriptive, powerful words out there; why not put them to work for you? Impact, as a verb: Another unfortunate example that proves if enough people say it. it becomes so. But it shouldn't. Let's leave "impact" as a noun (and, even then, use it appropriately). VIsioning: Here's a word that makes me shudder. "There's going to be a visioning session," someone told me recently with a straight face. I had to speak up for good grammar, and for common sense. It's difficult telling someone, including people I like, that a word is bafflegab and bureaucratic, but if it means plain, clear language is used, then that's the cost of a socially awkward moment. Blue-sky, as a verb: The words "blue sky" are nice to see in a sentence about the weather. But when I hear something like, "let's blue-sky this and see where it leads," I pray for rain. Reaching out: This is a question of usage, and is becoming prevalent in bureaucratese. I've noticed purported professionals writing something like "I'm reaching out because," and they use it when the writer means to say something like, "I would like to involve you in this" or "I would like you to act on this" or ... well, something else. Like a lot of jargon, it's not always easy to figure out what's meant. I'm amazed that public relations people (particularly in the UK, where some journalists have complained about the usage) deliberately choose a phrase that makes things fuzzy, not clear. "Learnings": This one came on my radar a few years ago, when a colleague returned from a meeting and related how an organizer had said at the end, too earnestly, "Now, what are our learnings?" I've heard it many times since, and I've cringed every time. Passive voice. Want to know a phrase that drives me mad? "It was decided that..." People often use the passive voice when they're not sure what they want to say, or, worse, don't want to be accountable for what has been said. It's sometimes a necessary writing choice, but it's usually much better to go with the active voice. A friend of mine who runs writing courses emphasizes one thing: if you can't or won't use the active voice, your writing will never, ever sing. "If at first you don't succeed, redefine what you did as success." "If the eyes are the window to the soul, then why does it hurt when I spray them with Windex?" "There's an old saying about those who forget history. I don't remember it, but it's good." 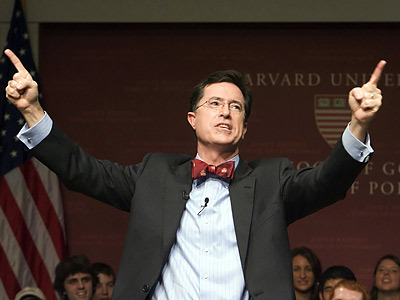 I haven't been watching a lot of TV lately, including the Colbert Report, which I had been recording nightly. So, I missed out on ongoing entries in this summer's Greenscreen Challenge, dubbed Make McCain Exciting. As with previous ones, like a Star Wars mashup that was won by some guy named George L., contestants had to work with a source bit of tape ... and their imagination. I actually had read about this one, which brilliantly splices some McCain lines with Madonna's Vogue; it's funnier to watch. How about putting some Elvis swagger into the picture? 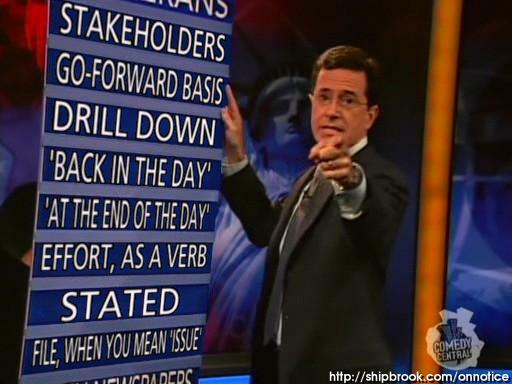 This website features an "on notice" board - inspired by Stephen Colbert's ever-changing list of bile from the Colbert Report - that you can customize to fit whatever bothers you. I made my list about some of the phrases that annoy me most. Stakeholders, of course, goes first. The word does accurately describe people who hold a stake in something, but it's clumsy, awkward and too easily used to bunch people together who otherwise have little in common. 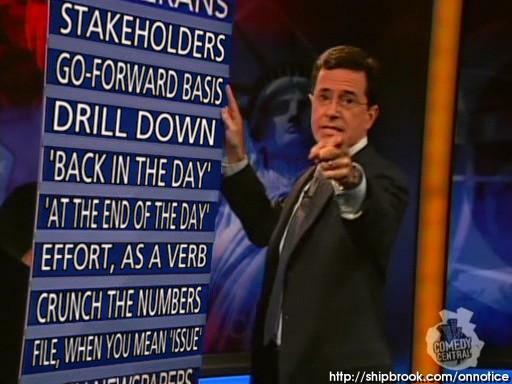 Go-forward basis is merely an officious way to say "from now on." Drill down is another phrase that has the whiff of action and movement, but is just a cliche. Back in the day is a popular bit of slang, but it has no business in, say, news reporting. Which day? For that matter, which year? It reminds me of another vague phrase, "in recent memory." Speaking of day ... at the end of the day is a bit of verbal filler that politicians, in particular, seem to embrace while talking to reporters. Effort is a nice noun; it's a wretched verb. "So-and-so is efforting that" is a sample usage. Be thankful if it has not invaded your workspace. A Toronto colleague of mine calls it the E-word. Crunch the numbers is a cliche, and seems only to mean that someone is doing simple math, or even just looking up some figures on a spreadsheet. Finally, file. A more official way of saying, say, "issue." I first noticed its use in federal government circles, well over a decade ago. Brian Tobin brought it to Confederation Building, and it's entrenched now. "So-and-so has take the lead on that file" is an example. As a coworker of mine remarked last week, one could just as easily say "that." Indeed, let's leave it at that. Those are some of my pet peeves. If you generate your own On Notice board, let me know.